Undoubtedly, Diwali is India’s biggest festival. Homes are lit with sky lanterns, fairy lights, earthen lamps knowns as diyas, rangoli designs (colourful decorative patterns) adorn the entrance of each home, and entire neighbourhoods, shops and communities are lit up marking this auspicious moonless night known as Amavasya. While the date of Diwali depends on the position of the moon and the Hindu lunar calendar, Diwali celebrations last for four to five days and occur sometime between October and November. As with all other Indian festivals, Diwali signifies different things to people from different parts of India. As a traveler in India, you may opt to explore the exciting festivities of North India or undertake a soul searching experience celebrating Deepavali (another name) in the South. In the North, Diwali is celebrated as Lord Rama’s homecoming to Ayodhya after defeating the Rakshasa King of Lanka, Ravana. In Varanasi, Diwali is a grand affair, with the special evening Ganga Aarti, which lights up the entire Ganga river with the thousands of earthen lamps which float over the surface. As the evening is brought on by chants from sadhus (Hindus priests), people welcome Diwali by bursting firecrackers and wishing one another. South India celebrates Deepavali as the death of Narakasura, a feared demon, at the hands of Lord Krishna. While in most of the country bursting of crackers begins at sundown, in Tamil Nadu, a state in southern India this happens through the day. People awake at the crack of dawn to have a traditional oil bath. After bathing, new clothes are put on and bursting of crackers and sparkles follows. Celebrations here actually wind up by evening, the time festivities hit their peak in other parts of India. The days leading to Diwali see shopping at its peak. Families buying clothes and gifts, women getting mehendi applied (henna plant) on their hands and children buying crackers. An air of festivity spreads through India, as folk travel across the country to celebrate the Festival of Lights with their loved ones. 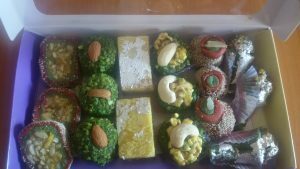 Across India, family and friends gather to wish each other, exchange dry fruits, mithai (Indian sweets) and gifts. Lakshmi Puja, (a prayer to the Goddess of Wealth) is offered on the evening of the main Diwali day and the stock market is kept open for an hour of auspicious trading. 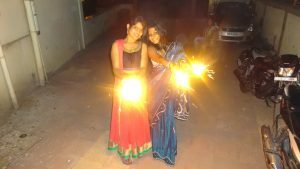 In urban India, Diwali has come to be associated with a week of card parties that end in a grand evening of fire crackers. If you are in India during Diwali, make sure to definitely experience and enjoy the festivity first-hand. Make a few friends and visit their family during Diwali. There is nothing better than celebrating Diwali with a local family. If that is not possible, you can still enjoy the festival by dressing up in traditional Indian wear – kurta for men and a sari for women and join one of many Diwali parties that are organised at restaurants, where you can gorge on traditional Indian festive food and dig into an assortment of mithai. Indulge yourself by burst a few non-polluting fireworks and end the night walking down the street admiring the beautiful decorations. 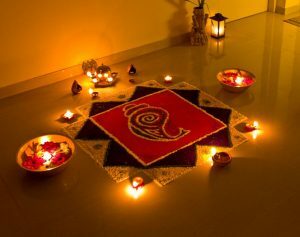 Diwali is an official holiday in India, Fiji, Guyana, Pakistan, Malaysia, Mauritius, Myanmar, Nepal, Singapore, Sri Lanka, Suriname, and Trinidad and Tobago. Next Post:What Travel means to Me!